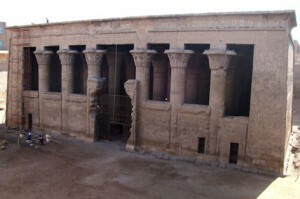 Esna is situated about 50 km south of Luxor on the west bank of the Nile. It is easily to visit in one day from Luxor and it is a popular start for river cruises. In ancient times Esna, with the adjoining town of Enit or Yunit, was one of the most important places in Upper Egypt. Its Egyptian name was Tesnet. The Greeks called the town Latopolis, after the Nile perch (Lates niloticus), a fish here revered as sacred as it seems to be the embodiment of the goddess Neith and buried in extensive cemeteries. Esna was increasingly important during the 18th dynasty due to Egypt’s developing relationship with the Sudan. There was a route established between Esna and Derr. Later, the city slowly declined until it received renewed interest during the 26th dynasty. Later, under the Greek and Romans, it became the capital of the Third Nome of Upper Egypt. During the medieval period the town regained importance and a modest degree of prosperity as a caravan station and as a market for the agricultural produce of the area. Today Esna is a busy merchant and farming town, with a weaving industry. There are two main points of interest in Esna. One is the temple of Esna, dedicated to the triad of Khnum, Neith and their offspring Heka. The creator god Khnum sculpted all living things on his potter’s wheel. The Temple of of the ram headed god Khnum is about 200 m from the river and lies some 9 m below street level in a pit. The temple was built in Greco-Roman times by the Ptolemies on the site of older temples. The temple was remarkable for the beauty of its site and the magnificence of its architecture. It was built of red sandstone and its arcade consisted of six rows of four columns each, with lotus-leaf capitals, all of which however differ from each other. The temple remains now consist only of the first hypostyle hall of columns. Constellations, including a beautiful zodiac, are decorating the ceiling and the relief on the walls show a king catching water birds with a net. There are blocks from an early Christian church in the forecourt of the temple, foretelling of a time when Esna was an important Christian centre. Near the Temple of Khnum on the stone quay along the cornice are carved cartouches of Emperor Marcus Aurelius. The other main point of interest is the lively covered market street, which fills a couple of streets leading inland from the cornice. Here one may purchase fabric or have the fabric made into clothing. On Saturday there is a camel market.